At sea aboard USS Enterprise, Oct. 11, 2001 — Sailors aboard USS Enterprise (CVN 65) take a break from the business of the day for meals and relaxation. However, never far away are reminders of the serious mission supported by every member of the crew. 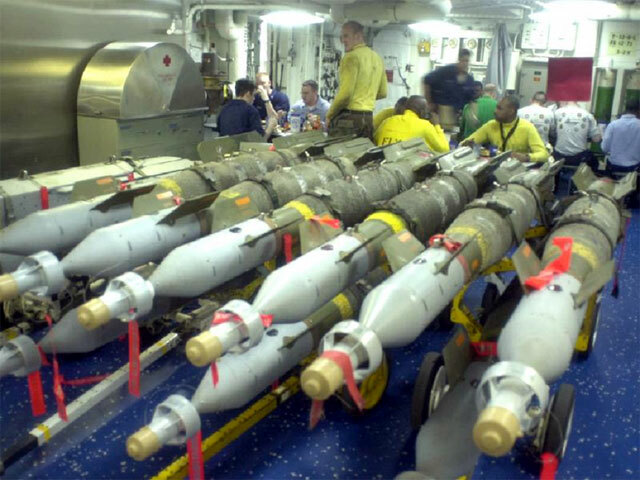 Bombs stand ready on the mess decks, prior to their transfer to the flight deck above, for missions over Afghanistan in support of Operation Enduring Freedom. 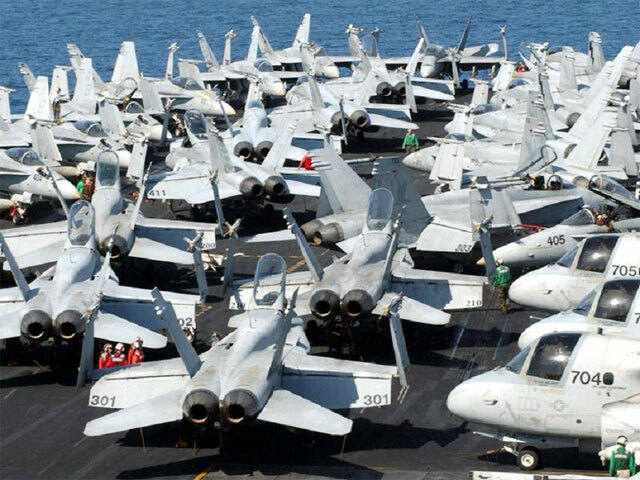 At sea aboard USS Theodore Roosevelt, Nov. 14, 2001 — F/A-18 Hornets and S-3B Vikings assigned to Carrier Air Wing One (CVW-1) aboard USS Theodore Roosevelt (CVN 71) are staged on the bow of the ship during a scheduled break in flight quarters. Even though Roosevelt's flight deck is 4½ acres in size, the size and number of the aircraft dictate that each inch is used efficiently. 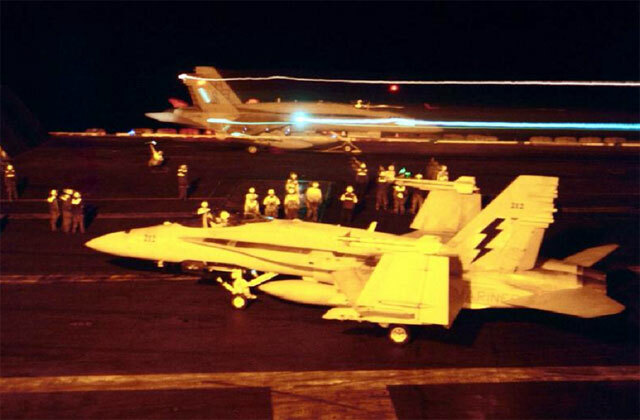 At sea aboard USS Theodore Roosevelt, Nov. 13, 2001 — An F/A-18 Hornet from the "Sidewinders" of Fighter Attack Squadron Eight Six (VFA-86) is catapulted into the night sky during flight operations aboard USS Theodore Roosevelt (CVN 71). 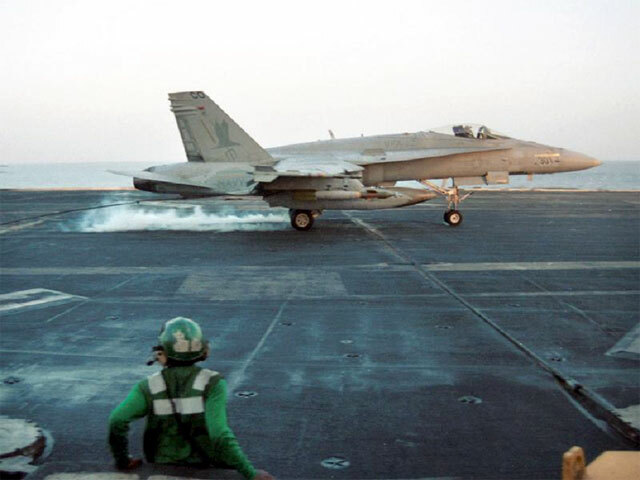 In the foreground, a second Hornet, this one from the "Thunderbolts" of Marine Fighter Attack Squadron Two Five One (VMFA-251), awaits its turn for launch. 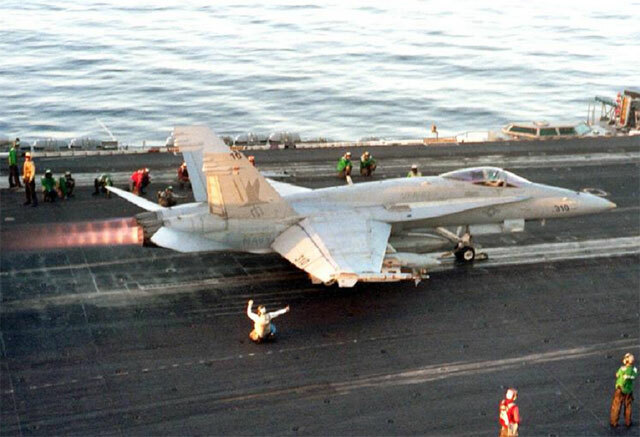 At sea aboard USS Theodore Roosevelt, Nov. 6, 2001 — Arresting gear officers observe the landing of an F/A-18 Hornet from the "Marauders" of Strike Fighter Squadron Eight Two (VFA-82) on the flight deck of USS Theodore Roosevelt (CVN 71). 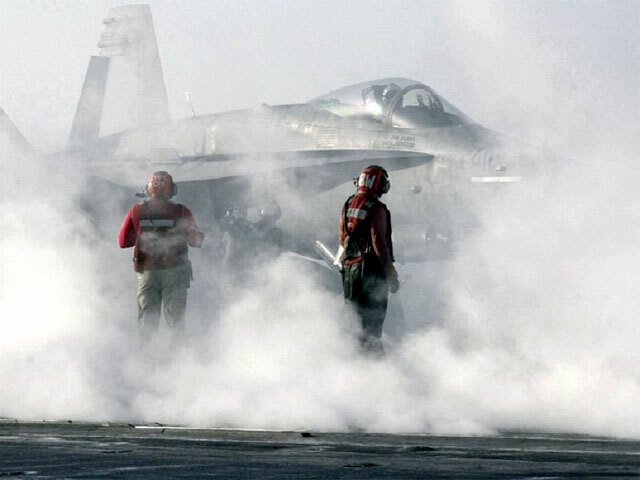 The arresting gear officers ensure that the arresting gear is properly set for the type of aircraft that is about to land, and for ensuring the landing area is clear. 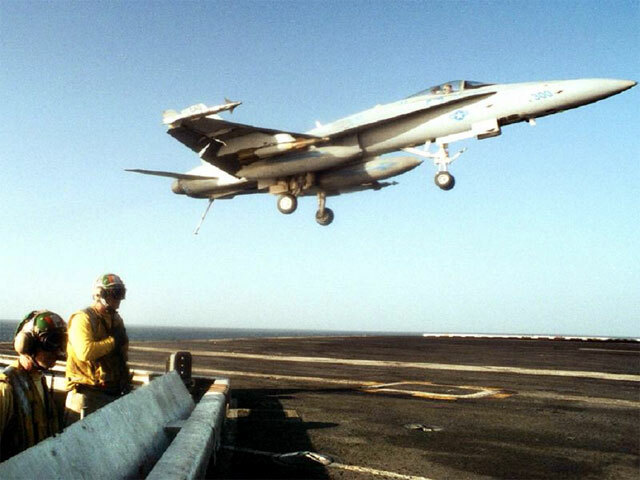 At sea aboard USS Theodore Roosevelt, Nov. 5, 2001 — An F/A-18 Hornet from the "Marauders" of Strike Fighter Squadron Eight Two (VFA-82) takes the number 3 wire for an arresting gear landing after a strike mission over Afghanistan. VFA-82 is deployed aboard USS Theodore Roosevelt (CVN 71), which is part of Operation Enduring Freedom. 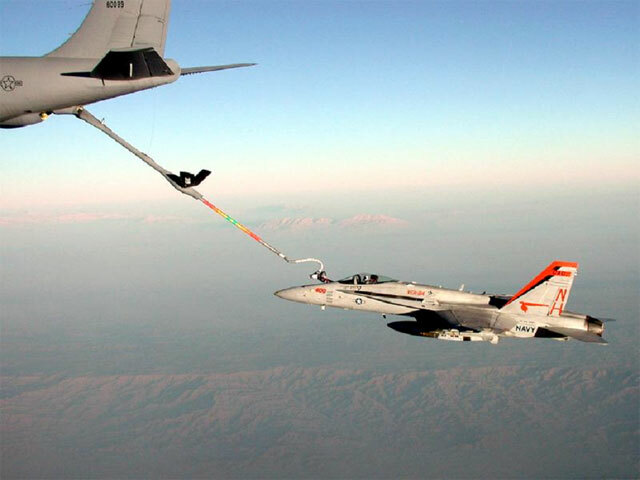 Operation Enduring Freedom, Nov. 4, 2001 — An F/A-18 Hornet from the "Mighty Shrikes" of Strike Fighter Squadron Nine Four (VFA-94) receives fuel from a U.S. Air Force KC-135 tanker. VFA-94 is assigned to Carrier Airwing Eleven (CVW 11) aboard USS Carl Vinson (CVN 70). 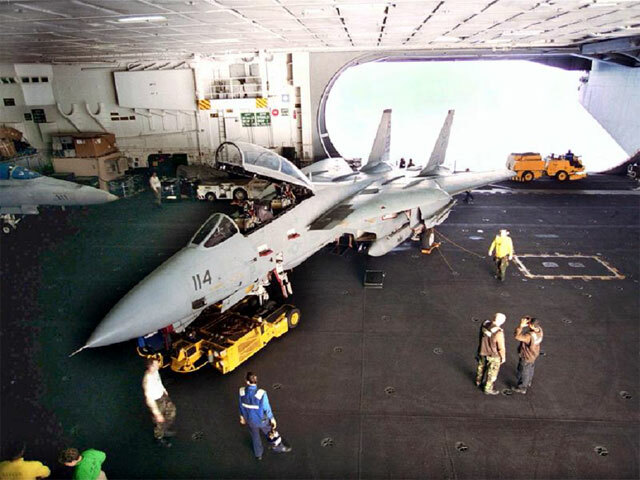 At sea aboard USS Theodore Roosevelt, Nov. 3, 2001 — An F-14 Tomcat from the "Diamondbacks" of Fighter Squadron One Zero Two (VF-102) is brought into hangar bay 3 on board USS Theodore Roosevelt (CVN 71) for maintenance. 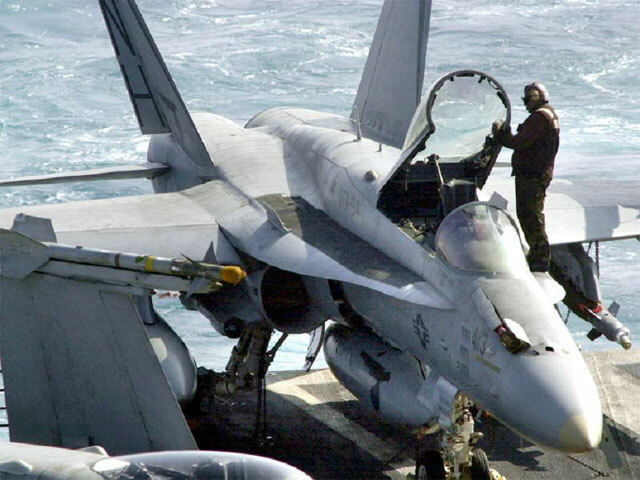 At sea aboard USS Carl Vinson, Nov. 1, 2001 — A plane captain from the "Mighty Shrikes" of Strike Fighter Squadron Nine Four (VFA-94) washes the canopy of an F/A-18 Hornet aboard USS Carl Vinson (CVN 70). Plane captains are responsible for the general care and upkeep of their particular aircraft when they're not being flown. An experienced Airman (AN) or Petty Officer 3rd Class, the plane captain also supervises refueling, rearming, and movement when re-spotted on the deck. 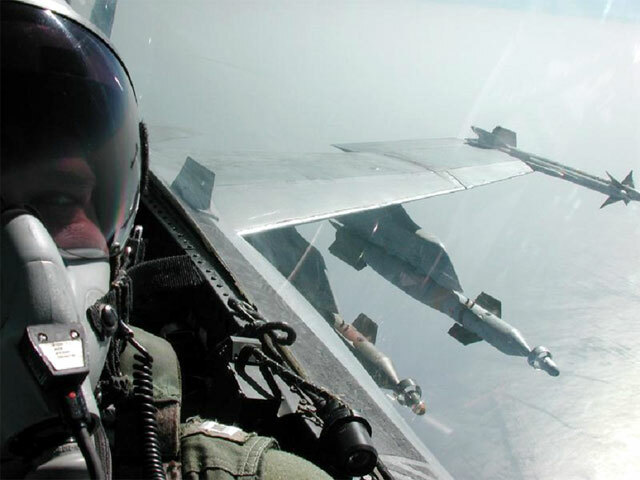 In the skies over Afghanistan, Oct. 31, 2001 — Two 500-pound Laser Guided Bomb Units (GBU-12) (left) and an AIM-9 Sidewinder short-range air-to-air missile are visible on the wing of an F/A-18 Hornet from the "Mighty Shrikes" of Strike Fighter Squadron Nine Four (VFA-94). VFA-94 is assigned to Carrier Airwing Eleven (CVW 11) aboard USS Carl Vinson (CVN 70). 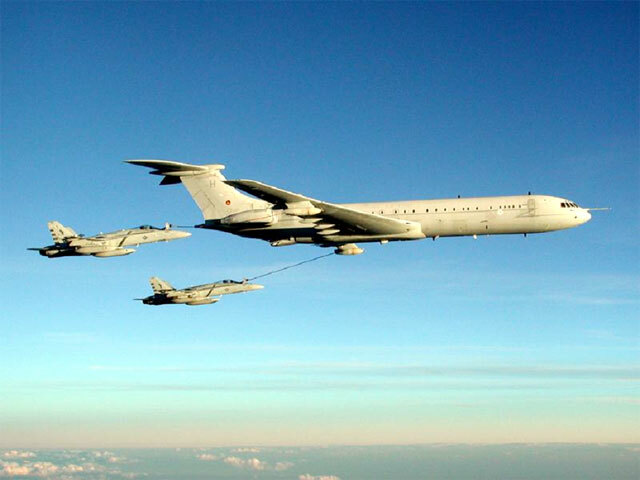 Operation Enduring Freedom, Oct. 31, 2001 — Two F/A-18 Hornets from the "Fighting Redcocks" of Strike Fighter Squadron Twenty Two (VFA-22) receive fuel from a British Royal Air Force VC-10 tanker. VFA-22 is assigned to Carrier Airwing Eleven aboard USS Carl Vinson (CVN 70) which is part of Operation Enduring Freedom. At sea aboard USS Theodore Roosevelt, Oct. 23, 2001 — An F/A-18 Hornet from the "Marauders" of Strike Fighter Squadron Eight Two (VFA-82) ignites its afterburners as it is about to be catapulted from the flight deck of USS Theodore Roosevelt (CVN 71). 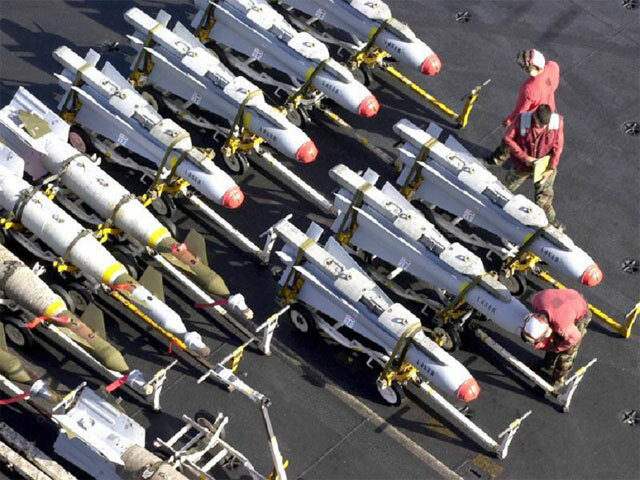 At sea aboard USS Enterprise, Oct. 18, 2001 — Aviation Ordnance personnel aboard the carrier USS Enterprise (CVN 65) inspect AGM-65 Maverick air-to-surface tactical missiles and guided bomb units (GBUs) prior to their being loaded on the ship's aircraft. Enterprise and her embarked carrier air wing are part of Operation Enduring Freedom. 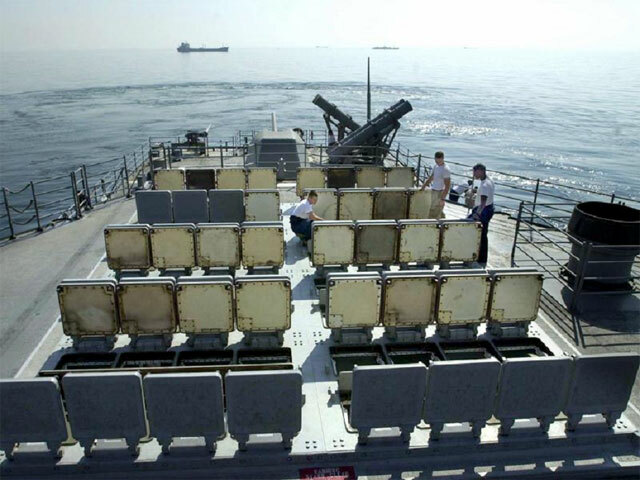 At sea aboard USS Antietam, Oct. 16, 2001 — Ship's Gunner's Mates aboard the cruiser USS Antietam (CG 54) conduct operational checks on the aft vertical launch system (VLS). These inspections, which include checking for standing water in the module, condition of gaskets and proper timing for automatic doors, are important in ensuring the ship's operational readiness. Antietam has been conducting maritime interdiction operations (MIO) in the waters of Southwest Asia.